When thinking about brands, big corporations like Apple, Coca-Cola and Nike often come to mind. It can be easy for business owners to assume that branding and brand marketing strategies are reserved only for big businesses. On the contrary, small businesses can and should take advantage of any opportunities to market their business’ brand. By the end of this article, we hope to show you why it’s important for your business, big or small, to market your unique brand and how to do so successfully. As stated above, when most people think of the word “brand,” they think of incredibly popular and iconic companies. This idea can be overwhelming for a small business to compete with. It’s important to understand that your brand is defined by your company: what you do, and what you stand for. Think of your brand as a promise to your potential and existing customers that you will provide them with the best version of the services you offer. Your business’ brand should differentiate your business from its competitors and show that you can provide a unique product or service. You can create and shape your brand through a variety of materials. A great way to establish your brand is to invest in a customized logo. Visitors will be encouraged to take your business seriously if you have a dynamic, clean logo that stands out among the competition. Having a unique logo is a sure way to impress potential customers, and increases the likelihood that they will remember your business and return again. An effective logo can be used in all of your business’ marketing materials, whether it is featured on your website or printed onto any physical materials your business produces. Investing in a professionally designed, custom website is another great way to shape your business’ brand. A custom website allows your business to fully express itself online, while highlighting the professionalism, individuality and quality that sets your business apart. 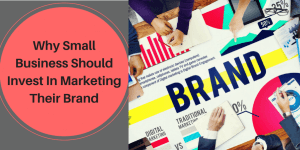 How can a small business effectively market their brand? The first step to effectively marketing your brand is to do what your business does best: provide high-quality goods and services. Maintaining a consistent business practice is one of the best ways to ensure that customers will keep returning to your business time and again. You want customers to associate your brand with quality so they will refer other potential customers to your business as well. The next step is to integrate your business’ brand into your entire business model. Your business’ mission, practices and logo can be displayed online, on your products and out in the world, even if it’s something as simple as a bench ad in your local neighborhood. A great way to bridge the gap between your business’ print and online material is to use QR codes. QR codes can be printed onto physical material and scanned via mobile phones to bring users to your business’ website. Investing in a version of your business’ website that is compatible with mobile devices is a great way to increase your business’ accessibility and reach. Mobile device owners use their smartphones and tablets from morning to night, so making your website mobile responsive allows your organization or company to be available to customers whenever and wherever they might need. Using search engines is a great way to expand your brand’s marketing strategy online. A professional internet marketing firm can promote your business’ website correctly to get a top 10 ranking on search engines like Google.com and Bing.com. Paying attention to consumer habits is sure to improve your brand marketing strategy. Consumers love when businesses demonstrate innovation and creativity in their practices, and a customized website is a great way to show off these skills. By using your website to feature your business’ various social media outlets, you allow customers to choose the online experience that works best for them, while still keeping them informed about who you are and what you do. Use your website as a place to publish material that connects with customers personally, as well as professionally, and create content that consumers will want to share with those around them. Understanding how to create a brand and market it effectively and efficiently is no easy task. At V8Web, our team of professional brand marketers specializes in helping businesses succeed online through marketing strategies, logo design, web design, SEO services and more. We ensure honesty and transparency in all of our services. Contact our web design company today and begin your journey to online marketing success at [email protected] or (507) 581-9451.